In this page we will walk through the spring MVC themes tutorial and example with ThemeResolver using annotation. 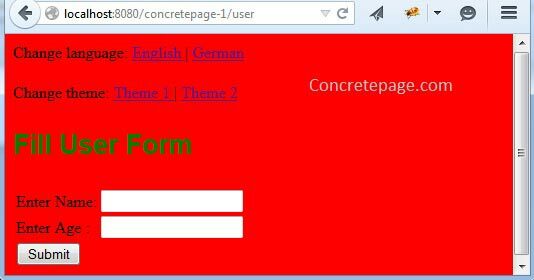 Spring MVC provides custom theme resolution. We can give the different theme options to our users in web application that can be handled in spring MVC in easy way. This is same as spring MVC internationalization and localization handling. The main API which handles themes are ThemeSource, ThemeResolver and ThemeChangeInterceptor. In our theme example we have also accommodated the code of spring MVC internationalization and localization and for the explanation, find the link here. To understand the spring MVC theme we will go step by step. Find the demo project structure in eclipse. 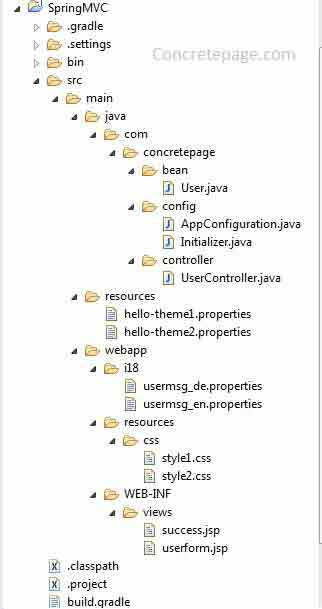 In java configuration create bean for ThemeSource, ThemeResolver and register ThemeChangeInterceptor to achieve spring MVC themes. org.springframework.ui.context.ThemeSource is an interface that resolves themes. It enables parameterization and internalization of themes. ResourceBundleThemeSource is the implementation of ThemeSource. It finds a java ResourceBundle per theme. We need to tell it file base name using which ResourceBundleThemeSource resolves the ResourceBundle. We need to create bean with spring reserved name as themeSource. Here we have set file base name as hello-. File name should start with this prefix. org.springframework.web.servlet.ThemeResolver is an interface that is used for theme resolution strategies. We need to create a bean with the spring reserved name themeResolver. The implementations of this interface can handle theme resolution via request and changes in theme via request and response. The implementation classes are based on session and cookie etc that are given as follows. FixedThemeResolver: This is the default implementation of ThemeResolver which uses the fixed configured default theme. It can be set by defaultThemeName() method. The default name is theme. It does not support setThemeName because fixed cannot be changed. CookieThemeResolver: This is the cookie based implementation of ThemeResolver. We need to create bean for CookieThemeResolver and set cookie name, cookie max age, default theme name etc. For custom theme setting, a cookie is set on browser and till the next change and expiry time, cookie value remains in browser and selected theme is displayed onwards. Cookie based approach is useful in stateless websites. Find the bean creation for using CookieThemeResolver. Here we have set cookie name as mythemecookie that will contain the custom theme name. The default theme properties file name will be hello-theme1.properties. SessionThemeResolver: This is the session based implementation of ThemeResolver. This approach is useful where the application has user session. In case of theme custom setting, a theme attribute is set in user session. The theme attribute name can be overridden by using setThemeName(). We can create the bean as below. Here we have set the default theme name as theme1, so the full name will be hello-theme1.properties. org.springframework.web.servlet.theme.ThemeChangeInterceptor is an interceptor that allows to change theme per request. This is achieved by a configurable request parameter. The default request parameter is theme. Find the code how to register ThemeChangeInterceptor. For the demo, we need some CSS file, and to include these resources, we need to tell spring about the URL pattern of resources. As our CSS file has been kept in resources\css, the URL pattern can be defined as below in the code. The method addResourceHandlers() has been overridden from WebMvcConfigurerAdapter. For the demo we are using following CSS files. Find the properties file used in our demo. Find the properties file for i18n. Find the JSP file being used in our demo. We have created two links that will change the theme. Find the bean used in our example. By default the hello-theme1.properties file will be loaded. We will get the output as given below. 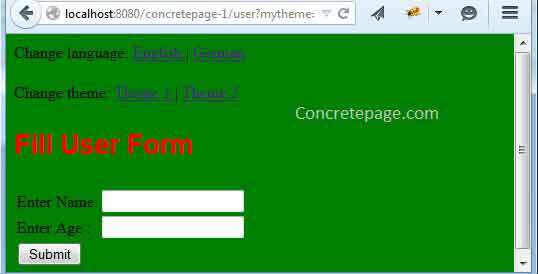 This output can also be achieved by the URL http://localhost:8080/concretepage-1/user?mytheme=theme1 On submit the page, we will get output as below. We will get the output as below. And on submit, the output will be as below. As we are using CookieThemeResolver in our demo, so our defined cookie mythemecookie will be set in browser. To change locale and theme together we can use locale and theme parameter together in query string that will look like. Now I am done. Happy Learning!